Vigorous upright shrub, which can ultimately become quite large. Large matt green leaves. 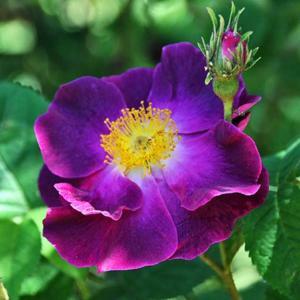 Single to semi-double flowers, opening deep velvety red with golden yellow stamens, then ageing to an unusual violet-purple colour. Large orange-red hips in autumn. By grafting, cuttings or separation or rooted suckers. Old heritage variety, probably originating from the Netherlands in the 1700's. 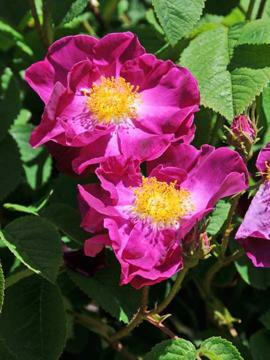 Although sometimes sold as Rosa 'La Belle Sultane', this may in fact be a slightly different cultivar.